IREPS e-Auction: How to change the Bidding Password? IREPS e-Auction bidders can change their bidding password only after login. There are two options for bidders to change their bidding password. The first option is for those bidders who know the current bidding password and the second option is for those who forgot their current bidding password. iMMIS: e-Procurement has been started through IREPS on all Depot and Division level of SECR. iMMIS has been started on all Depot and Division level of SECR. All vendors are informed to aquire Digital Signature Certificates and registered with IREPS for participation in local purchase, LT & BT at Depot/Division level. Click Here to see notice on official website. 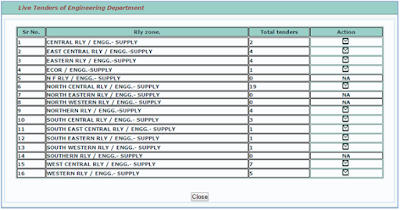 iMMIS: ECR shifted to e-Procurement for all local purchase (LP & LT) through IREPS. This is for information of all the suppliers that for all local purchase (LP & LT) of materials in stores Deptt. Dhanbad of ECR, E-procurement under IMMIS is implemented. Thus in future mode of purchase in the Deptt. in Dhanbad Division will shift to E-procurement. In view of the above all concerned suppliers are requested to get this firms registered with website www.ireps.gov.in of IREPS and inform to this office above. For details information please visit website www.ireps.gov.in. Click Here to view official notice. IREPS registered users needs to change the Digital Signature Certificate (DSC) attached to their profile if their DSC got expired and they have purchased a new DSC. To change the DSC attached to their profile they can submit a request to IREPS Help Desk to change their DSC through the link Request For change of Digital Signing Certificate available on Help Desk page. IREPS e-Auction: How can Bidder get the format of Affidavit? The format of the affidavit is available on the registration form page under the link named Affidavit. The bidder has to produce the affidavit duly notarized on stamp paper of requisite value. 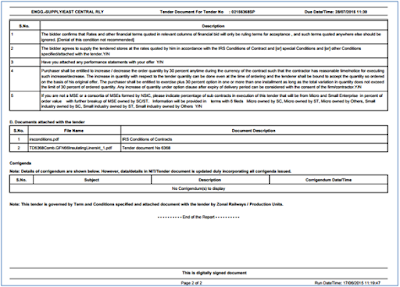 To download the format of affidavit please Click Here. 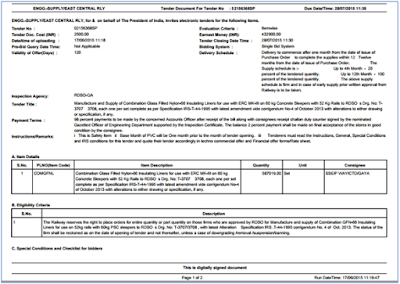 How to download Tender Documents published by Indian Railways through IREPS application? 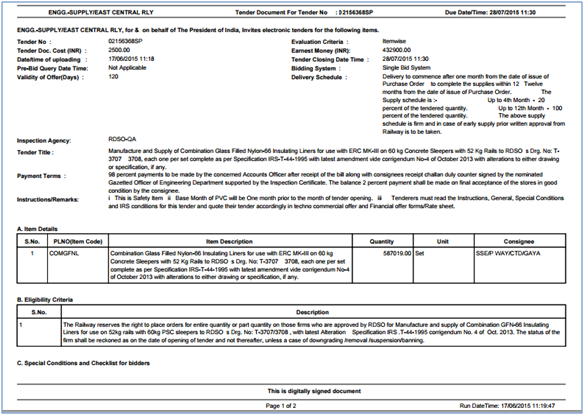 Anyone, who can access the www.ireps.gov.in download the Tender Documents published by Indian Railways through IREPS application. To download the tender document first, you need to search the tender through Quick Search or Advance Search after that click on the tender number to view or download the tender document. 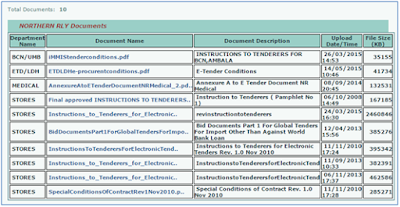 Anonymous users can see the tender document only for live tenders but registered users can see the tender document for all tenders after logged in on www.ireps.gov.in. 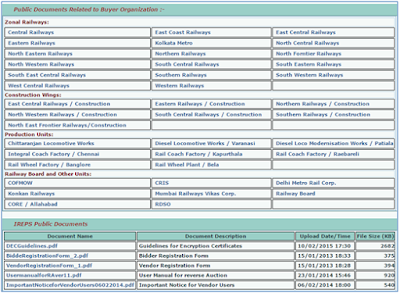 How to see Indian Railways live tenders by their type or organization? 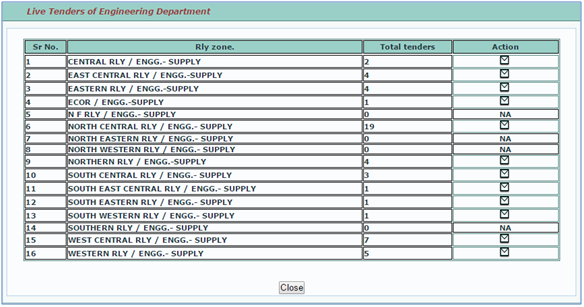 Click on the link Engineering (PCE) Tenders to see the all PCE department of railways. 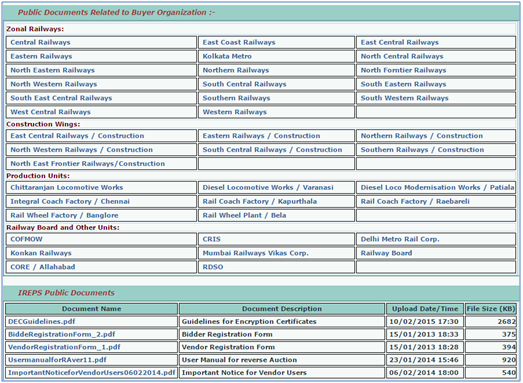 If you want see the list of all live tenders published by East Central Railway (Engg. 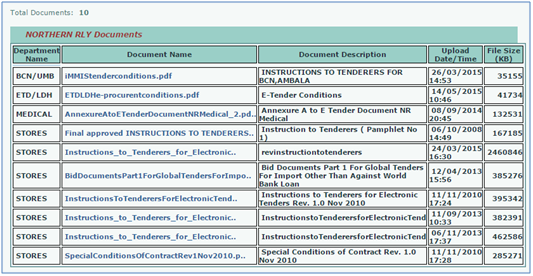 Dept) then click on the Action icon corresponding to it to see the list of tenders. IREPS Public Documents link provides the access of the all public documents uploaded by different Zonal Railways, Construction Wings, Production Units, Railway Board, CORE, DMRC, KRCL, MRVCL etc. Any one who a can access the IREPS website can view and download these documents by clicking on the relevant links. If you want to see the public documents uploaded by Northern Railways the click the link Northern Railways under Zonal Railways and you will be able to see the list of all public documents uploaded by Northern Railways. To view/open any document click on the Document Name. IREPS e-Tender: How to view Financial and Techno-commercial Tabulations for vendors? First vendors need to login, without login they will not be able to view any tabulation or offer. Vendors can view the Financial and Techno-commercial Tabulation for Open (Advertise) and Special Limited type tenders in which they have participated and submitted financial bids. 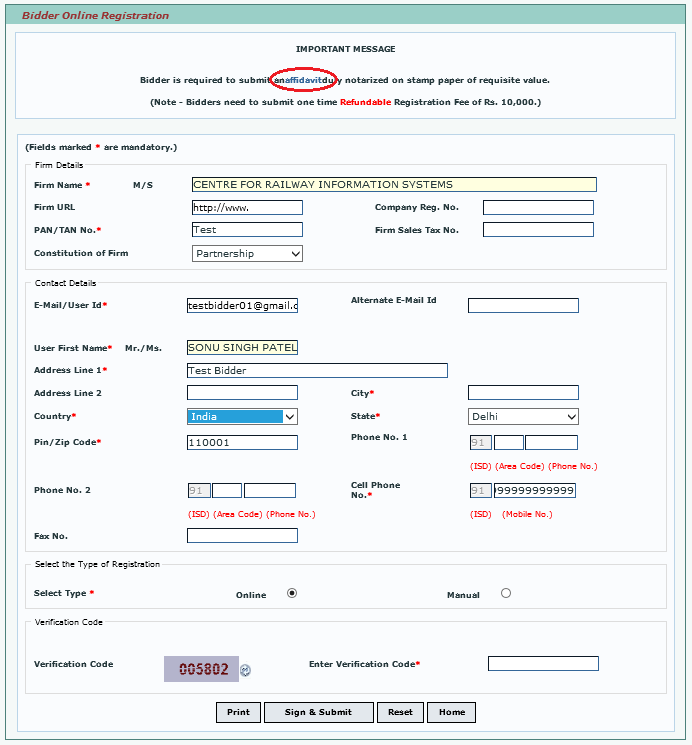 For rest type of tenders they can view only their offers in which they have participated. IREPS e-Auction: What are prerequisites for registration of new Bidders with IREPS application? 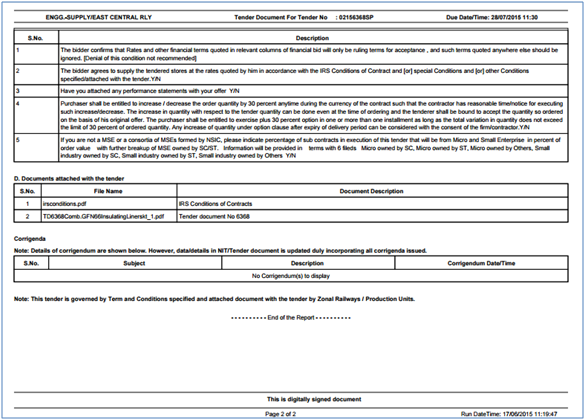 A valid Class III Digital Signature Certificate with Bidder's firm name issued by licensed Certifying Authorities details of which are available in the website www.cca.gov.in under the link Licensed CAs. A valid email address to get the user id and password after successful registration. An Affidavit duly notarized on stamp paper of requisite value. One time registration fee of Rs. 10,000. For registration click on the link New Bidder (E-Auction) available in left navigation block on the www.ireps.gov.in. On registration page bidder can either select Online Registration (bidder needs to pay the registration fee online) or Manual Registration (bidder needs to deposit the registration into the Depot). 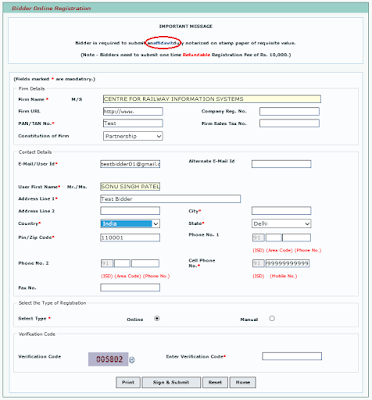 What is the use of Digital Signature Certificate in IREPS application? Registration of Vendors and Bidders: To participate in e-tendering and e-auction vendors and bidders must be registered on IREPS application and without Digital Signature Certificate registration is not possible.